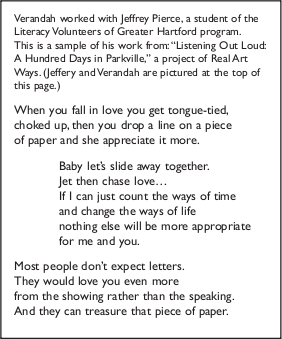 Verandah developed a practice to create, preserve, and share personal literature with those who need a writing partner. She listens, probes, and records the told poetry or shared narrative of a diverse community. Verandah has created these collaborative writing projects in literacy and crisis centers, hospitals, factories, nursing homes, senior centers, a 200-year-old Vermont tavern, and an urban working-class neighborhood. Verandah facilitates creation and distills language with each participant in residencies of one week to a year. Plan together to design a unique project unearthing diverse experiences of community members. Produce ananthology, performance, or exhibition. Verandah is available to open conferences with a powerful, easy icebreaker: told poetry. Participants befriend one another by watching and engaging in listening, writing, and sharing. Communities in Vermont can apply to the Vermont Arts Council for matching funds. "She puts this light onto each person, with so much appreciation and honor. Now you see that everyone is extraordinary." "...the interview situation melts away, people start talking to her from the heart." "Verandah sees our living, breathing communities and people as American masterpieces." Sylvia Moss Solomon, gifted pianist and world traveler, was a resident at Linden Lodge, a nursing home in Brattleboro, Vermont. Here she talks with Verandah about her rich past. To find out more about hiring Verandah as writing partner or for additional information please click here.